If you have student loans, you know they can be a source of overwhelming stress. High interest rates and daunting debt amounts can make the prospect of paying back your loan seem impossible, and even making small dents in your balance can feel fruitless. But, it might be helpful to remember that you are not alone. As of 2018, the national student debt is roughly $1.5 trillion, and it affects more than 44 million borrowers. Given the data, it’s obvious that rising student loan interest rates are a concern for many. Thankfully, there are ways to protect yourself in these trying financial times, whether you’re an undergraduate or graduate student, or a parent of a college student. Below are some of the statistics related to student loan interest rate hikes in 2018 and solutions for guarding yourself against the potentially devastating financial impacts of those increases. At the basic level, interest rates come in two types: variable and fixed. The difference between the two types of interest rates is about what you’d expect from the name; fixed interest rates don’t change, while variable interest rates, well, vary. In other words, if you have a fixed interest rate, then you typically don’t have to worry about your interest rate increasing (or decreasing) over the life of your loan. So, if you have a student loan with a fixed 5% rate, you’ll be charged that 5% rate for the full term of the loan. 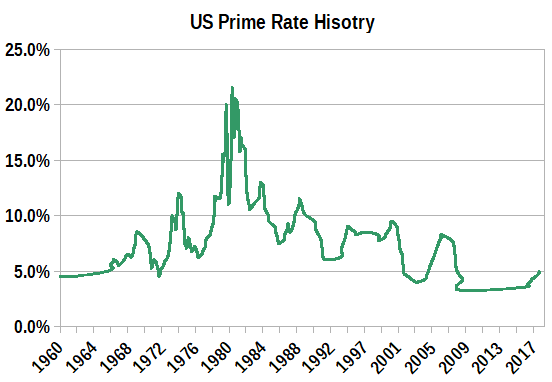 So, when the Federal Reserve determines that the economy is doing well, it raises the Prime Rate, typically by about a quarter of a point at a time. As a result, variable interest rates will increase by the same amount. For example, if you have a variable loan that charges a flat 5% on top of the Prime Rate, then a Prime Rate increase from 4.5% to 4.75% would cause your interest rate to jump from 9.5% to 9.75%. The type of interest rate charged by your student loans will depend mostly on the type of loan. Federal (public) student loans operate differently than private student loans — primarily because the federal government regulates public student loans, while private loans are typically direct bank loans. In general, federal student loans have fixed interest rates, but the exact rate will depend on when the loan is disbursed and can vary by year. 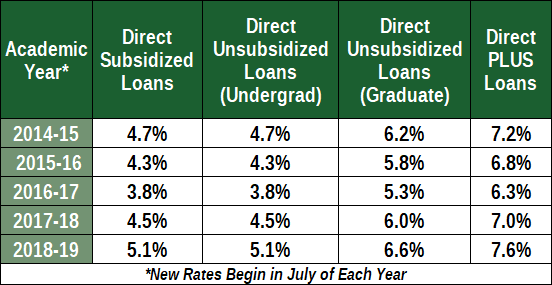 A direct subsidized loan taken out for the 2017-2018 school year, for instance, will have a lower interest rate than one taken out for the 2018-2019 school year, but the rate won’t change on the loan you already have from the previous year. While the rate can change annually, rates are standardized — everyone pays the same rate for the same loan disbursed the same year. The interest rates for federal student loans are set by the government; more specifically, rates are set by the Federal Reserve. The Federal Reserve bases student loan interest rates on the Treasury Department’s auction of 10-year notes each spring (plus a fixed margin). Congress has established that undergraduate interest rates cannot exceed 8.25%, graduate interest rates will not go over 9.5%, and parents taking on loans to support their children’s college education will never face interest rates greater than 10.5%. Private student loans, on the other hand, are not capped or standardized, so they have significantly more variation than federal loans. Depending on the lender, private loans can have either a fixed or variable APR, and the exact APR you are offered will typically depend primarily on your credit profile. The better your credit, the less interest you’ll likely need to pay. Federal loans are typically recommended over private student loans thanks to the standardized and capped interest rates, however, private student loans can be worth exploring if you have excellent credit, as you may qualify for a rate below what’s being charged for federal loans for that year. Unless you’ve been living under a rock, you likely realize that college tuition is expensive — and the cost keeps getting higher. Even a two-year degree can run you more than $3,500 a year, and a four-year degree from a private college will typically cost 10 times that amount. For many students, loans are the only real way to pay for a college education, however untenable the idea may be. But, taking on students loans doesn’t have to mean living in fear that the next rate spike will ruin your repayment plan. There are things you can do to help defend against rising interest rates. The simplest way to ensure that rate changes don’t impact your student loan repayment is to choose a loan with a fixed interest rate. Many federal loans have fixed interest rates, and some private lenders may also offer fixed-rate loans. With a fixed-rate loan, you’ll pay the same interest rate for the life of the loan, even if the rate changes. For example, if you have a Direct Subsidized Loan from the 2015-2016 school year that charges a 4.3% interest rate, you will pay that rate for the duration of your loan, even if standardized rate increases the next school year. Fixed-rate private student loans may not be as appealing as their variable-rate competition at first, as you may find a lower rate on a variable loan. However, the Prime Rate has risen for much the last decade, making it likely that you will be interest rate increases over the life of a variable-rate private student loan. If you’re stuck paying a variable interest rate — or even a fixed interest rate that is too high — you may want to consider refinancing your student loans. While there are no federal student loan refinancing programs, you can refinance either a federal or a private student loan with a new private loan. Borrowers who wish to refinance their student loans at a lower rate will have the best luck if they have good to excellent credit. You can use various credit monitoring services to check and track your credit scores, as well as determine what to do to increase your score before finding a refinance loan. The higher your credit score, the better the interest rates you’ll be offered. In addition to checking your credit scores, be sure to evaluate your credit reports for any negative items, errors, or unsubstantiated accounts. 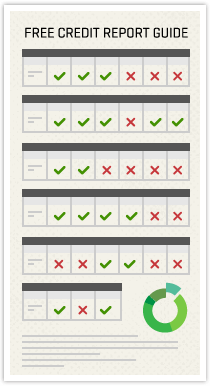 If you find any mistakes on your reports, dispute them with the credit bureaus immediately, either yourself or with credit repair professionals, like those at CreditRepair.com. Another benefit of refinancing is the freedom to change your loan term. Student loans can have payback periods of a few years, up to 20 or even 30 years. The payback period you selected at the time may not be what is best for you now. Having the ability to change your payback period for your student loans offers enormous flexibility and a potential safety net. Keep in mind that extending your loan term will result in a more expensive loan as you will wind up paying more interest over the life of your loan. You should only consider extending your student loan terms if you need to reduce your monthly payment to avoid falling behind. If you have any intention of taking advantage of certain government repayment options, such as Income-Based Repayment (IBR) or Pay As You Earn (PAYE), then you may not wish to refinance your loan. Private student loans are not typically eligible for federal repayment plans. Ultimately, with student loan interest rates on the rise, staying informed is essential. Arming yourself with the most up-to-date information and latest news related to federal increases is your most powerful course of action as a borrower. Of course, sometimes loans can become too much to bear on your own. There is no shame in seeking help. Many student loan lenders will work with you to create a payment plan that you can afford to help you stay on track. By using the tools and information available to you, refinancing when you’ve built up your credit, and asking for help when you need it, you can successfully overcome student loan debt.